Green Toys is going from the playroom to the dining room with Green Eats, a new line of eco-friendly tableware for kids. We’re always psyched when we hear that Green Toys is coming out with something new. Whether it be the makings of a pizza parlor, stackers for the littlest of hands, or the latest vehicle for our junior construction crew workers, their products always come with the same promise: made from 100% recycled milk containers, packaged using only recycled and recyclable materials and printed with soy inks, and free of melamine, phthalates, or BPA. For those of you keeping track, the California-based company has recycled more than 6 million milk jugs into its ever-expanding toy line. 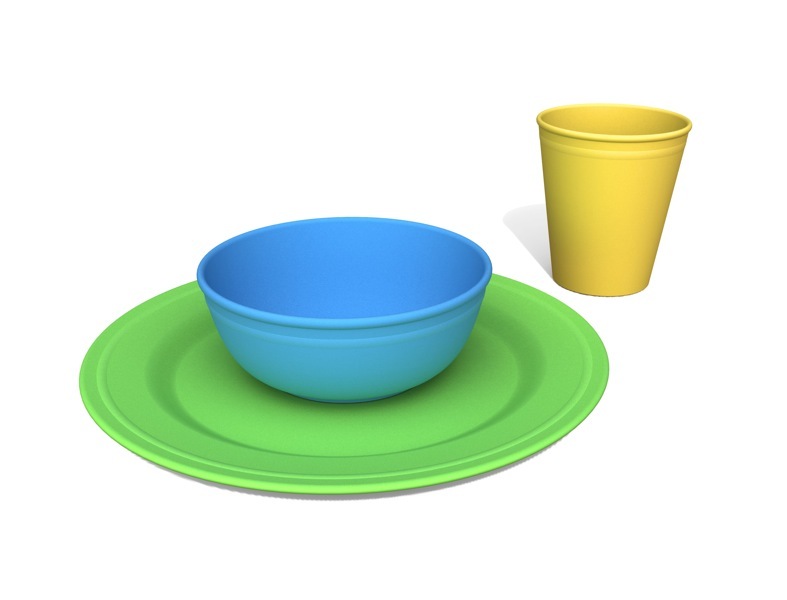 Now these dishwasher-safe plates, bowls, utensils, trays, and tumblers come in bright kid-friendly colors and are perfect for little ones who aren’t exactly ready for your family’s best china, but who have graduated from the high chair tray (which covers just about everyone from ages 2-10!). Let the kids mix and match the orange, green, blue, and yellow pieces, and they may even volunteer to set the dinner table! The Green Eats line will be available online and in stores in early June. Green Toys is going from the playroom to the dining room with Green Eats, a new line of eco-friendly tableware for kids. We�re always psyched when we hear that Green Toys is coming out with something new. Whether it be the makings of a pizza parlor,�stackers for the littlest of hands,�or the latest vehicle for our junior construction crew workers, their products always come with the same promise: made from 100% recycled milk containers, packaged using only recycled and recyclable materials and printed with soy inks, and free of melamine, phthalates, or BPA. For those of you keeping track, the California-based company has recycled more than 6 million milk jugs into its ever-expanding toy line. Now these dishwasher-safe plates, bowls, utensils, trays, and tumblers come in bright kid-friendly colors and are perfect for little ones who aren't exactly ready for your family's best china, but who have graduated from the high chair tray (which covers just about everyone from ages 2-10!). Let the kids mix and match the orange, green, blue, and yellow pieces, and they may even volunteer to set the dinner table! The Green Eats line will be available online and in stores in early June.